I am fast burning bridges to my former life as a pseudo-anorexic. The good thing about this is I eat out and enjoy eating out immensely. The bad thing about this is there seems to be so many wonderful culinary stalwarts around Melbourne that I’ve never dined at before. 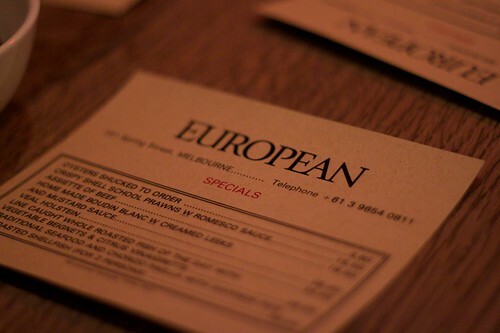 The European Restaurant on Spring Street in the CBD was till recently one such place. Dinner was at the rather late hour of 9pm. After a quiet, leisurely stroll through the Treasury Gardens and making friends with some possums there, I arrived to find I was first, and on time. A glass of manzanilla while I wait! Eventually a semi-apologetic T turns up having been wooed by the beer choice at Biero Bar over the other side of the CBD. 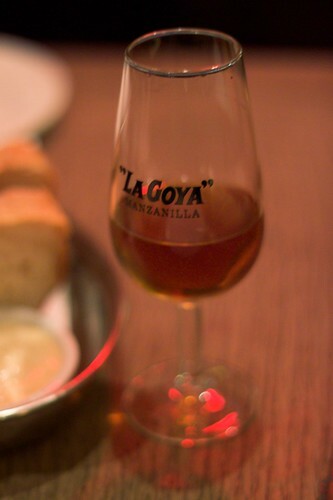 Hello glass of amontillado! I am always reminded of Poe’s short story whenever I see the name ‘Amontillado’. We were still waiting on our chum Nat but she was running late. My tummy couldn’t wait much longer, so I ordered. I was in the mood for lots of small dishes, rather than one large main. 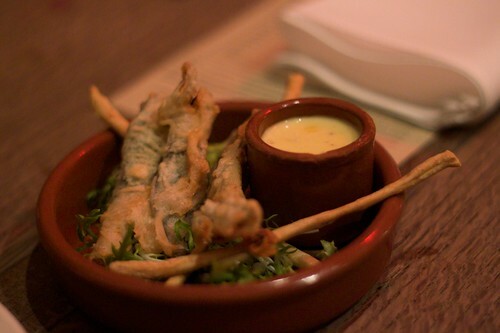 First up, sage and anchovy fritters. Beautiful, feathery-light batter coupled with the saltiness of anchovies. The accompanying sauce was zesty. 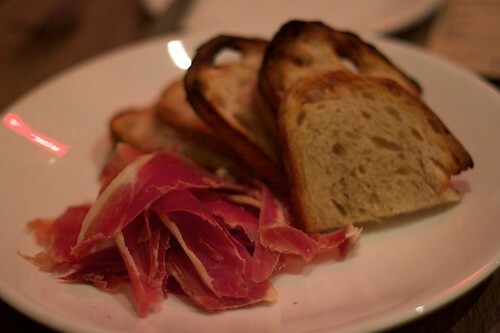 Next up, some jamon Serrano with a generous amount of sourdough. If beer and cheese won’t be the death of me, then cured meats definitely will! I hadn’t had any cured meat for a while so this actually felt like a massive treat. But no, wait! I haven’t finished clogging my arteries with fatty, meaty goodness. 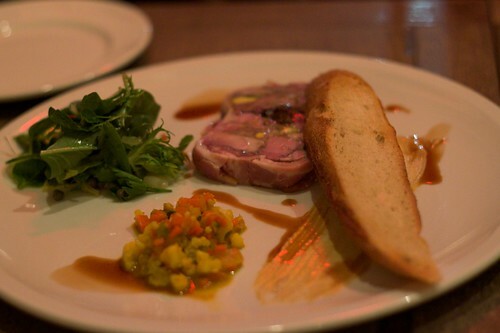 Thus the duck terrine with house condiments and grilled baguette came to the rescue! 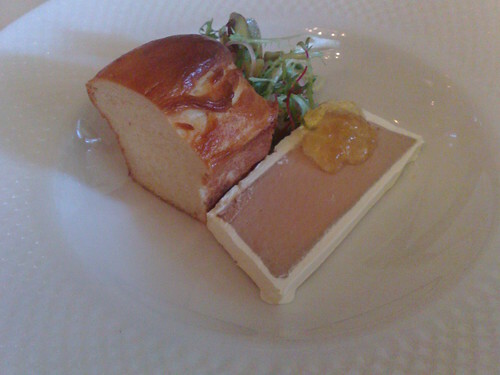 T wasn’t too impressed with the stingy serving of the terrine. Haters gonna hate, as all you hip kids say. 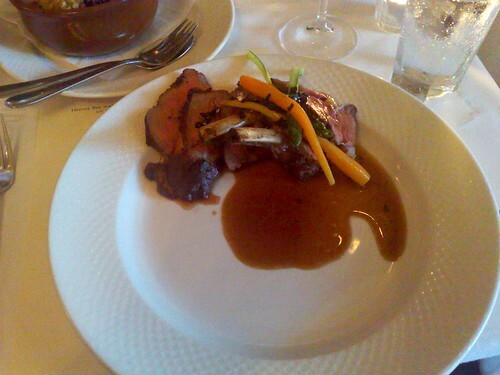 I loved the small side salad, it was so tart and set off the gamey flavour of the duck well. That was good! Yea, Nat arrived! 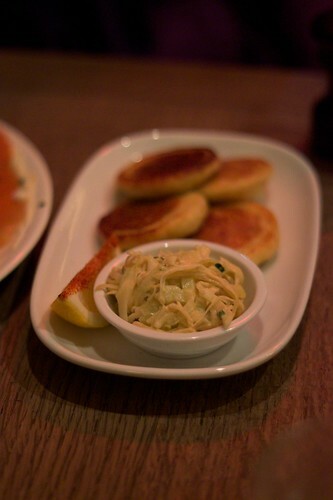 She chose the Tom Cooper smoked salmon celeriac remoulade and horseradish cream. 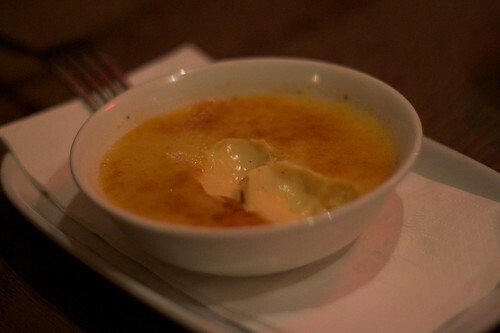 She twisted my arm and we both finished off with vanilla bean-flecked crème brûlée. Personally, I prefer mine with a thicker crust of burnt sugar. This one was politely singed. Still, quite a blissful late night meal. The main menu is available till 10pm and after that they change to a reduced supper menu which still has lots of substantial items to constitute a damned fine meal. Given my insomniac tendencies, I know I’ll be back. This entry was posted in eatie-foodies dining out and tagged CBD, French food, Italian food, late-night dining, Spanish food, The European on September 15, 2010 by gem. 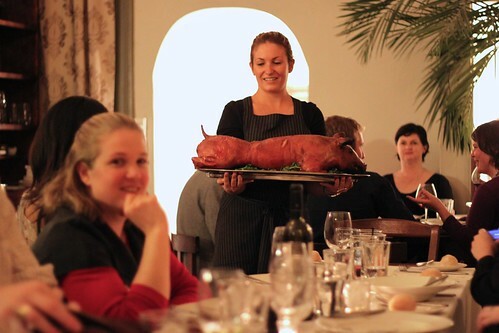 The mission was simple: find ten foodie friends and convince them to part with $75 each for a suckling pig three-course dinner. A year ago, this would have proved difficult, but thanks to the wonder that is the social networking, and the food bloggers community, this proved to be remarkably easy and better yet, all participants were extremely excited. I’ve had the pleasure of dining at Libertine in North Melbourne before for a very special degustation so I was in no doubt that all diners would be in for a very lavish meal with wonderful, attentive service. A few good friends came, and (hopefully) some new ones – food blogger-wise there was Agnes of Off the Spork and partner, @eatnik and a few of her posse, and Alex, Jess and Jillian from MSG. Billy of Half-Eaten also came but due to his dining partner needing to go to hospital due to a physical injury, he left early, and both of them were missed. For the benefit of those of us on Twitter, I assigned the occasion’s hashtag as #pigdestroying in honour of the death metal band Pig Destroyer. Let’s face it, we were all here to pretty much ‘destroy’ a pig. Thanks to Billy, I also got to taste some of the gentian-based aperitif. It really does taste of the flower and is very refreshing! It could become popular in summer if it were readily available. Twitter Melbourne stalwart @coliwilso braved absinthe, served in positively scientific apparatus which piqued everyone’s interest. 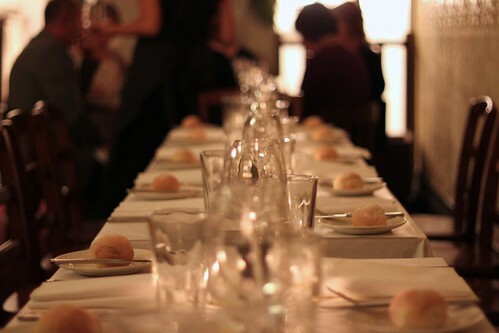 The way the dinner worked was that we were all going to have the same main, but had the choice of one entrée and dessert from a choice of three for both – all items were on the menu available to the non #pigdestroying ilk. Very few people chose the chèvre and potato paupiette with sweet corn basil soup and went with either the terrine du jour, or the Hervey bay scallops. 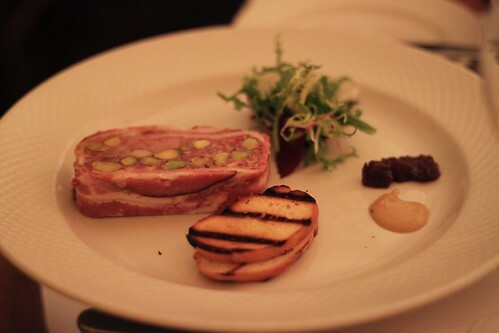 The terrine was venison with pistachio, served with mustard and pear chutney. I went with this because I can’t really resist venison when it’s offered. I was probably supposed to put some sliced terrine on the toasted bread and spread some of the mustard and chutney, but I didn’t really have enough patience to do so. 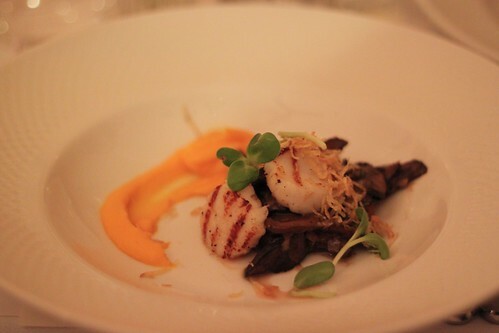 The Hervey bay scallops come with a forest mushroom ragoût. 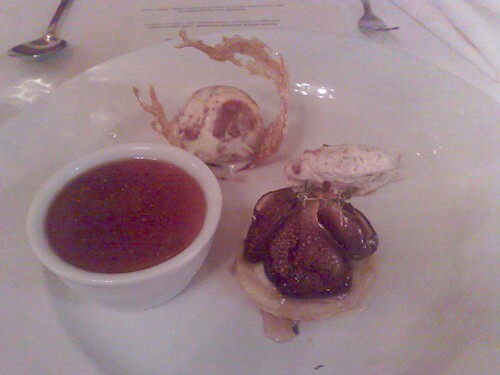 There was a judicious amount of time between courses, which is always welcome. I’m sure many a diner’s heart set about racing once the suckling pig was presented, brought around to all of us so we could get a good gawk. It’s a little confronting, given that the pig is about 15 weeks old at the time of slaughter. 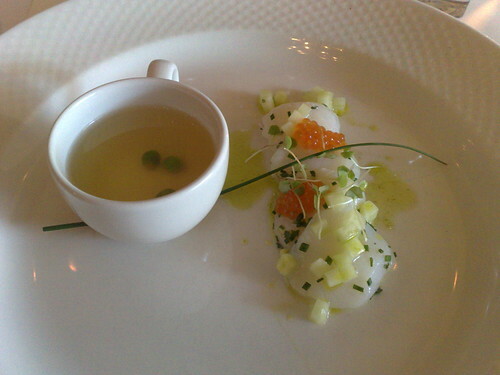 The serves looked more like this, with dreamy mashed potatoes and with what tasted like mustard leaves. 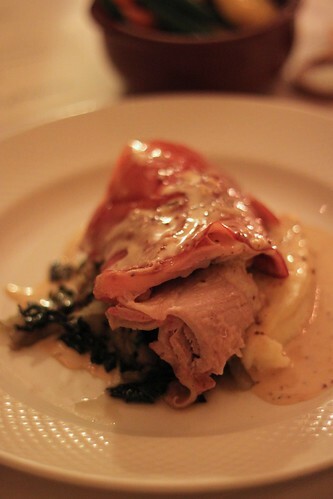 The skin was served too, and it was quite hard to cut into as the hide of the pig is very tender, it being so young. I left mine and concentrated on the tender meat and mash. It caused us a bit of amusement that they gave the lads larger servings than the ladies. I wasn’t going to complain – the servings were rich and filling and I think even a few of the lads struggled. 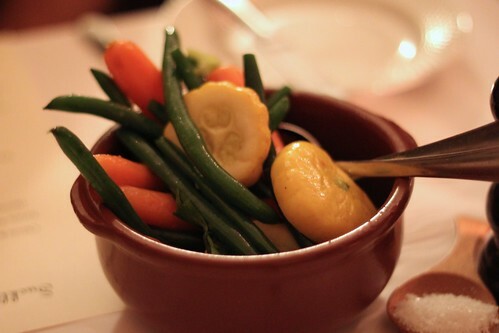 Not to forget the generous serving of baby vegetables – beans, squash and carrots. Delectable! We were all given extra mash, but don’t think anyone really needed it. Back to sweet, fluffy things – dessert. 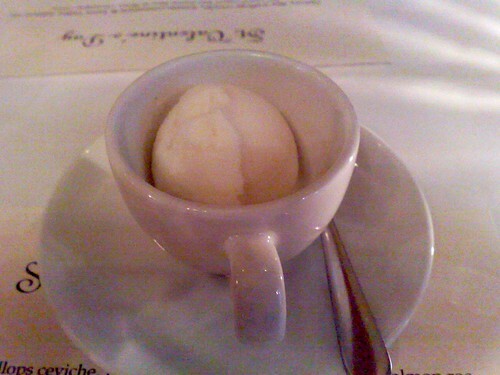 I chose a crème caramel with Calvados, accompanied by herbal tea sorbet. Couldn’t quite tell what sort of tea was used – it reminded me a bit of Earl Grey, and it definitely wasn’t peppermint. Whatever it was, it was refreshing and very palate cleansing, as you can probably imagine. 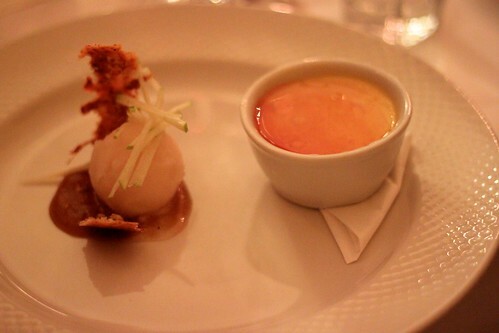 The crème caramel was not at all too rich. 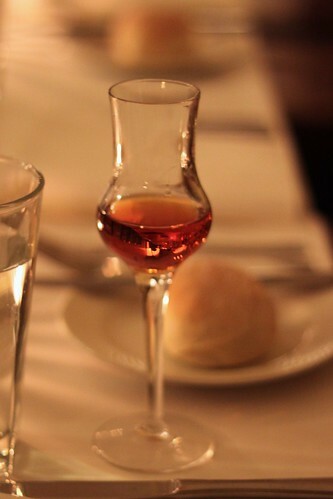 Sort of wish I could detect more of the alcoholic nature of the calvados, mmm! The other gorgeous desserts on offer were the chocolate pavé with warm plum mousse and almond crumbs and the passionfruit marshmallow with autumn fruit and seeded shard. I didn’t really get to hear any anecdotal reports about either as most of the people around me ordered the same dessert as me. 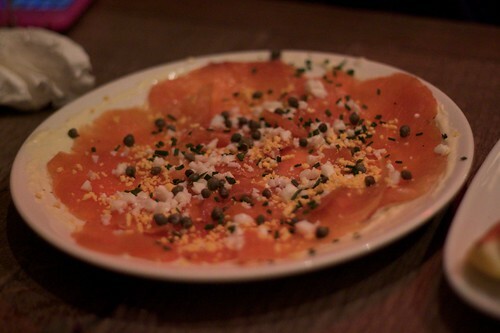 In my second time at Libertine, they’ve still managed to impress me so much. The staff are wonderful and always extremely helpful – I’m utterly useless with wine matching and was recommended the 2008 Leabrook pinot gris, Adelaide Hills from South Australia to accompany starters and the 2007 Pommier Bourgogne Rouge pinot noir from Burgundy, France with the main. It’s also excellent that they don’t make me feel like a wine idiot though I am most apologetic that their wine list is lost on me. In any case, if you don’t believe my glutton ravings about Libertine, you can read John Lethlean’s review for The Age though do note it’s quite an old one. 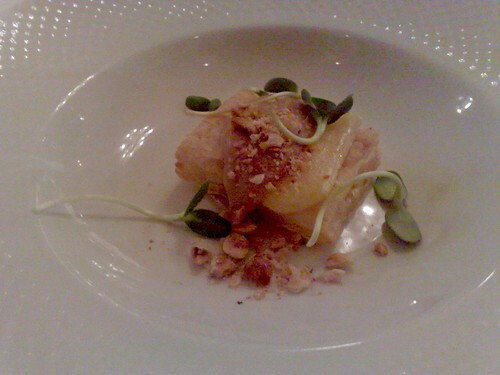 I’m sure I’ll be back to dine at Libertine before the year is out – it’s become a fond friend to me. Thanks very much to all the foodies and food bloggers who came and presented superlative company, as well as existing friends Tris, Colin, Suz and Lindsey who indulged my excitement by attending. Special mention must be made to Alex of MSG who was kind enough to drop off a very special doggy (piggy?) bag to Billy and Debbie while they waited in hospital to ensure that they didn’t miss out on the main attraction! 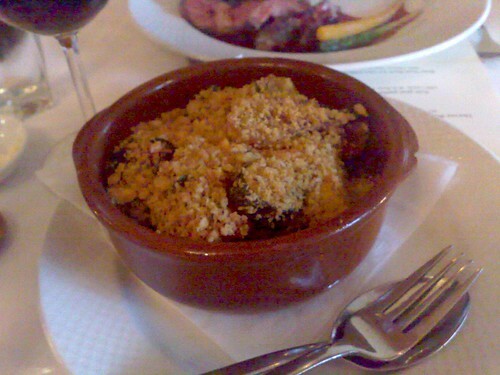 This entry was posted in eatie-foodies dining out and tagged French food, Libertine, Melbourne, North Melbourne, suckling pig banquet on May 10, 2010 by gem.